For 6 weeks, it’s been cold, snowy and at times windy… as you all probably know by now, I’m a fan of winter. Now, that doesn’t mean I like every aspect of winter but overall, it’s my season. Even with my passion for winter, I’ve noticed my thoughts shifting to a new wardrobe season filled with clogs, linen, and color. After deciding on my “professional attire” for the day, I made my way down the stairs to prep my morning cup of coffee… my favorite daily ritual. My thoughts were jumping all over the place sorting through my tasks for they day. I’ve been a bit inundated with work lately and have found this mental organization of my day infiltrating my special, quiet morning time. Quite honestly, these past couple of months have been challenging… just so much to do. I reached for the stack of mail and found a letter from the Gardens of Health. Recall, they were one of the organizations we supported through Project Peace. I opened the envelope and to my delight I found the most inspiring contents… a beautifully, hand-written note with a photo. Check that out! We are a team! This fuels me to persist. We are making a difference… one stitch, one seed, one veggie at a time. Our efforts ripple to reach others and we must continue to strive for a world filled with peace and justice. Through knitting, we are nourishing families. Peace and love to all of you on the Healthy Knitter team. Several people have asked if I’m still planning on a 2018 Project Peace bag. My answer to this is “yes” and “no.” We have the bags almost finished except for the screen printing and post-printing assembly. I’m considering creating a new screen print that will not be specific to the year… stay tuned. So, there will be a bag but it not break tradition. I’m still working on the patterns for the seeds of peace ebook. I’m nearing completion but it’s been a bit slower than I expected due to work and then changing my mind on a few of the designs. I can say that I really think you’ll agree that the patterns are worth the wait. Finally, last year, I decided to move the annual walk-along to the month of May (it’s been in April the past couple of years). This will align better with walking weather and my work schedule. I’m still debating if I will do this project as a mystery or not. If anyone feels strongly about this as a mystery (or not), please let me know. Here comes March! Can you believe it. Don’t forget we are still in the 64-day Season of Non-Violence (through April 4). Read more about this here. The daily intentions have been wonderful and you can join in anytime. It’s January 30… and in the Midwest, it’s cold… I mean really cold… with wind child it’s been -43F. And what a perfect time to begin a “daily intention” focused on peace-building. On January 30, 1948, Mahatma Gandhi was assassinated… a man committed to social justice, peace and a just world through non-violence. I was recently made aware of an organization that has created a 64-day season to bring awareness and specific action items that promote change through non-violence. A Season for Nonviolence was co-founded by Arun and Sunanda Gandhi of the M.K. Gandhi Institute for Nonviolence and a group of ten ministers forming the Leadership Council of The Association for Global New Thought (AGNT), the organization that convenes A Season for Nonviolence on an annual basis. Its purpose, to focus educational and media attention on the philosophy of attaining peace through nonviolent action as demonstrated by Gandhi, Martin Luther King, Jr., and a global community of nonviolence leaders and teachers. The 64-day long "season" begins with the anniversary of Mahatma Gandhi's assassination on January 30 and ends with the anniversary of Martin Luther King, Jr's assassination on April 4. 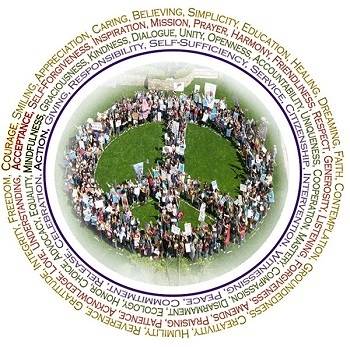 It is anchored by a mission, statement of principles, and commitments by participants towards living in a nonviolent way. The Association for Global New Thought provides lots of suggestions but this mandala is one of my favorites… Click on the image above and you’ll go to the AGNT website that houses the interactive mandala. On each of the 64 days, you’ll click on a word… today, January 30, click the madala (once you’ve made it to their website) and then enter on the word “courage.” You’ll find a quote, an affirmation, and a “practice” tip. There’s even some calming music that plays. Might I suggest incorporating this daily mandala into your knitting routine? View the quote and reflect on the message as you mindfully stitch… with each stitch you’ll be focused on how to create change in a non-violent way, perhaps for self, interpersonal relationships, community and maybe even at a larger level. If you’re interested in more about the effectiveness of non-violent change, you might be interested in the work of Erica Chenoweth and this very well known TedTalk. And finally, I’d like to bring your awareness to a wonderful group of knitters in Sweden led by Gerd Persson working to create change and promote peace through non-violence… This group of talented knitters has been making these knitted doves, attaching a tag to the beak that says “sticka for fred” or “knit for peace” and doing all of sorts of good deeds with the birds. They leave the birds in visible places with messages of peace. They’ve sent them to the United Nations, to the White House, on monuments with controversial messages. The pattern is currently available in Swedish and Spanish. If anyone can convert it to English, I’ll connect you with Gerd. What about sending peace birds to your local politicians? What about creating the birds in all sorts of colors, shapes and sizes and leaving them in key places to provide messages that promote diversity through knitting. 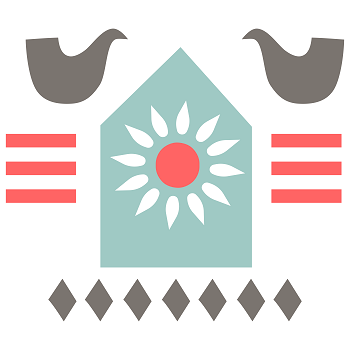 Be creative (as I know all of you are)… perhaps send peace birds to The Net Loft to be part of the Cordova Bird Project with a message that brings awareness to current issues (e.g. environment). Create your own tag for the beak, cards to attach, use a different design… again, another ingenious way to use knitting to create change, through non-violence! It’s been 5 days now since we celebrated Worldwide Knit for Peace Day and the culmination of the 3rd Project Peace. What a success I would say. Over $3000 raised to support the promotion of peace (with additional matching dollars from Seeds of Peace so really it’s $4500 contributed)… Helping our youth from around the world learn how to engage in healthy conversations despite differences and providing nutrition education, food and gardening skills to families in Rwanda to prevent malnutrition, a known predictor of violence through Gardens for Health. and seeds of peace were planted… if anyone is looking for evidence that knitting can create peace, look no farther than the comments left on Day 21. Talk about inspiring, uplifting, and an affirmation that making space for peace can be just what’s needed to cure what ails us. On Day 2 of Project Peace, I asked you to describe peace using words that began with the letter “p.” It wasn’t my intention to have every post begin with the letter “p” but I soon realized that every pre-planned blog post topic connected to a word that begins with the letter “p.” So I ended up with a bowl full of “p’s” or is that peas? or peace? and to make a promise to self on how you might continue to make space for peace in the upcoming days, weeks, months, and year. I’m so grateful to all of you for engaging in peace… for knitting for peace these past 21 days. I’ve learned that Project Peace is a path for all of us but also reflective of my own journey with peace. At the beginning of this year’s Project Peace someone wrote (my apologies that I’ve lost track of who this was) that this was her 3rd year of following Project Peace… in year 1, she read the blog, in year 2, she made a public post of some sort and this year she’s speaking to everyone she knows about peace. As I reflect on the blog posts for the three years, I also see how each year has taken a bit of a deeper dive into this topic… this path of peace. So, I’m not sure what this means for next year. I’m feeling a bit exhausted and have no idea of what I might say again next year. I’m sure with some rest and getting over this nasty cold I’ve developed that I might find my voice (and theme) for next year’s Project Peace. Don’t get me wrong, I’m inspired and have lots of ideas for knitting and peace… and I can’t wait to get started. I just don’t know what it means yet for Project Peace. If you have ideas, feel free to comment or drop me a line. Your feedback is always welcome and while I might not always respond, I’m certainly reading, thinking and reflecting. Project Peace 2018 ebook. The patterns in the ebook are forthcoming… the end of the semester, holiday planning and Project Peace became all-consuming. Look for the patterns to begin arriving in January. Peace and walking. I began The Healthy Knitter as a way to inspire knitters to adopt some healthy habits. And that is still one of my aspirations. I’m committing to walking a certain number of miles in the year 2019. My miles will be intentional miles not a cumulative number of miles per day. I began a thread 2 years ago for all of us to log our miles in a thread on The Healthy Knitter Ravelry group. It took us 2 years to walk around the earth… a fantastic commitment to those involved. I’d love to challenge us to walk around the earth in ONE year. Can you help us meet this goal? I’ll begin a new thread titled “Peacewalkers 2019.” Let’s start on January 1… walk what you can, just keep logging each week throughout the year. Rosie wrote: Oh dear lord - todays blog. 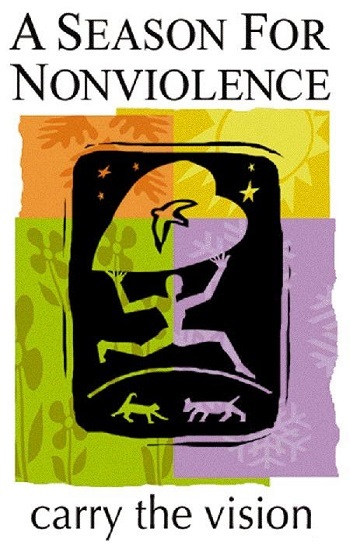 I am a meditator, a knitter, a lover of native plants, a hiker and and an activist. I also turned 90 this year. I have been looking for a project that I can do with my diminished physical abilities. The tempestry project really is it. I can’t wait. I want to do ALL 50 years. What a wonderful idea. Thank you for helping to make peace a focus of peoples lives. The winner of the final prize is Robin Strong. I was moved by everyone’s post and how much Project Peace means to all of you. I felt Robin’s post reflected a true example of seeds planted in multiple places and the power to affect so many others in just a simple way. Personally, this response spoke to me in a way that provided me with a path forward… where do I take peace from here. Thank you for the spark Robin and please email me)! Robin wrote: This morning, I'm taking your peace pledge to our 6th graders in homeroom. Thank you so much! We'll begin the conversation and set our intentions for being peacemakers in our school. Then after winter break, we'll come back to our pledge ideas, write them up in an artful way, and begin our time together in January with the intention to take every step in peace. I'll share with our teammates as well, and perhaps we'll plant even more seeds of peace among our students. Thank you! one that we must make space for in our lives.